Veneer Scaffold increase masons production and reduce labor cost. 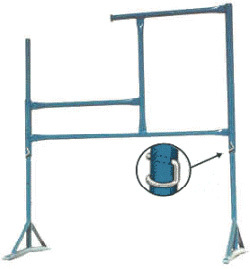 The scaffold sets up fast, without the need of braces and the legs adjust for unlevel ground conditions. Mason's platform adjusts from 26" to 50" high. (1 frame, 2 legs + 2pig-tail = complete unit) Specs: overall width 47 1/2".